First of all don’t despair! You can check out our handy guide on how to handle things ‘post-scam’ here! 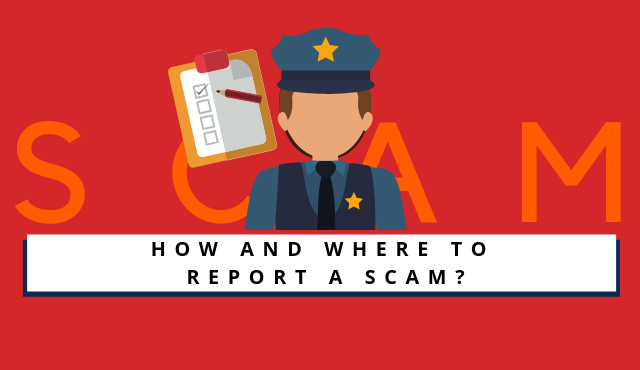 But in this article we will focus on who you should contact to report a scam and how to make sure you have the best possibility to stop the scammers! Step 1: Write down the order of events. It might sound like a simple exercise, but this allows you to collect as much relevant information as possible which may be useful when reporting a scam. It can also help you identify the best parties to get in contact with (In this case the social media platform could also be contacted to help them remove the online store if it is a scam). Take screenshots of online evidence that is hard to save. If you have purchased a product or service, often there will be evidence such as receipts, bank statements etc. that can be useful. It’s better to be overly cautious when collecting this, as even the smallest thing can help authorities identify and track down the scammer! Where can I report a scammer? That might sound simple, but with the global nature of the internet often the victims, criminal and the goods can be in three different locations. (However if you have been threatened by the scammer, our advice would be to contact local law enforcement immediately). So at Scamadviser we’ve put together a handy guide on agencies you can contact in order to report an online scam. We’ve ordered it by country/region to help you find the most relevant organizations! Action Fraud: national fraud & cyber crime reporting centre. Citizens Advice Consumer Service: cross sector fraud sharing initiative. Financial Fraud Action (FFA): fight against financial fraud on behalf of the UK payments industry. The United States Department of Justice has stated the following when it comes to different kinds of online crimes/scams (as of publication). US-CERT – Reporting is also available via the hotline (1-888-282-0870). Phishing attempts can be directed to phishing-report@us-cert.gov. Think there is an organisation or contact that is missing from this list? Let us know via the comments or contact us directly!